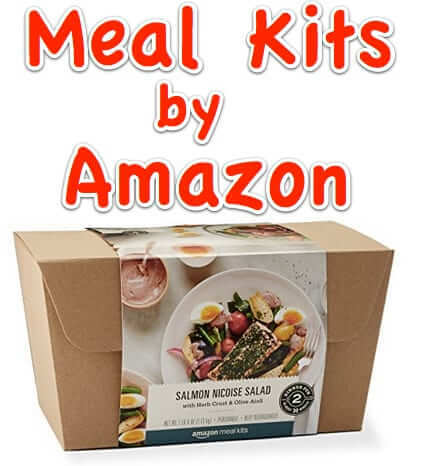 Apparently the pre-assembled, prepared food kit market is next, and Amazon is loaded for bear – or, at least salmon and Italian sausage (fear not, there are also vegetarian meals). “It makes perfect sense that as online grocery shopping grows it will drive the adoption of meal kits. Online grocery shoppers can save time by not having to search through multiple websites, and they both work hand-in-hand in meeting the consumer’s need for convenience with the delivery of a fresh meal they can prepare at home,” said food analyst Darren Seifer in an article in USA Today. 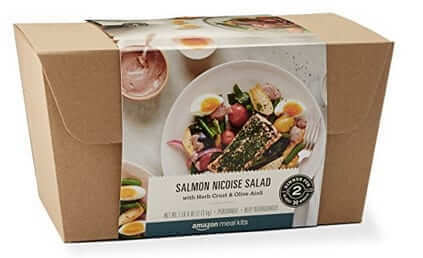 In fact, Amazon is already offering a limited selection of meal kits in a limited number of cities in which Amazon Fresh is already available. For example, according to the Guardian, customers in the Seattle area have their choice of 17 different ready-to-prepare meal kits. 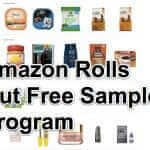 While you can see the Amazon Meal Kits on Amazon if you know the link, they won’t show up for you otherwise if you are not in a city where they are available. 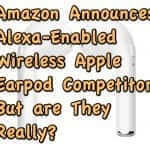 For example the Amazon Salmon Nicoise Salad with Herb Crust & Olive Aioli Amazon Meal Kit, the Orecchiette Pasta with Italian Sausage Amazon Meal Kit, and the Falafel Pattie with Tomato and Sumac Salad Amazon Meal Kit all have listings, if you know where to find them, but will not turn up on a search of Amazon if you are not within one of the service areas where they are available. In this twist on a classic French Provencal salad, tuna is replaced with fresh dill- and chive-coated salmon layered atop a rainbow assortment of potatoes, green beans, sweet red and yellow cherry tomatoes, and roasted artichoke hearts. In typical French fashion, it’s doused in a piquant mustard vinaigrette and served with hard-boiled eggs. Replacing black olives is a savory olive aioli to dollop on the plate. 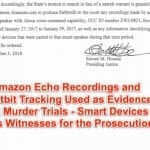 Reviews, although there are few so far, seem overwhelmingly positive (in fact, across the three above-mentioned Amazon Meal Kits, there is only one 1-star review, and all of the rest are 5-star reviews. That said, there are exactly 18 reviews in total across the three meal kits (8 for the Nicoise, and 5 each for the Falafel and the Orecchiette). This tasted a lot better than I was expecting. (I ordered it very unsure, but thought it looked healthy.) Wasn’t crazy about the olive aioli, but everything else was great. I am going to have to remember the method and timing for the eggs as they both turned out cooked perfectly like that. Price was fair for what we got. I’ve tried a couple of other meal kits where I didn’t feel like 2 servings was accurate, but this was definitely 2, very full servings. I was not hungry after this at all. My only real negative is I ended up dirtying 5 dishes just making this (and I even reused some). Also, there is SO MUCH packaging waste when you do meal kits, regardless of brand. They are all like that. So while I will do this occasionally, I can’t condone doing it all the time for me. I really enjoyed this salad. It has great flavour with fresh ingredients and it is easy to cook. I have learnt a new way to cook salmon, and it was perfect. The portion of salmon was great and the rest was enough for 3 meals, not just 2 meals. I have really enjoyed this meal. 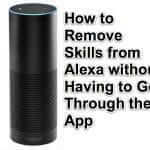 It is a great way to try new recipes and I am a big fan of Amazon Meal kits. I’ve now tried three of the vegetarian meal kits, and I think this one is my favorite so far-the falafel was so delicious and the skhug sauce was an amazing addition. I also had kind of forgotten how nice mint is in a simple vegetable salad-the salad was such a perfect side. I did end up adding a handful of panko to the falafel mixture as it was very loose after adding the water, however the spice mix that goes into it may have some kind of binder in it that would have tightened it up if I’d let it sit for a few minutes. I was impatient and I enjoyed the extra crispiness that the panko added, so I didn’t find that to be a problem at all. The falafel patties weren’t at all dry even with the addition of the panko, but next time I’ll let the mixture sit for a bit to see if it was actually necessary to add an additional binder. I also added just a splash of olive oil and champagne vinegar to the salad-I can never leave well enough alone when I’m cooking so that was probably unnecessary but I do like that there’s still some room to ‘play’ with these kits if you’re like me and you want to add a few personal touches according to your preferences. This was the second Amazon brand meal kit I made and it too was terrific. The flavor was great and I really enjoyed both the sauces that it came with. It was plenty of food for two and easy to make. We usually do Blue Apron and love it. Tried this and really love it! Food was delicious and we had leftovers. It was much easier than Blue Apron – no chopping. We cooked it in half the time and barely used any dishes. This meal was great and was a little spicy. The Amazon Meal Kits retail for between $15.99 and $19.99 and serve 2. 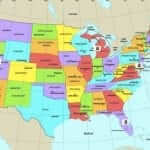 Do you think you will use this service if/when it becomes available in your area? 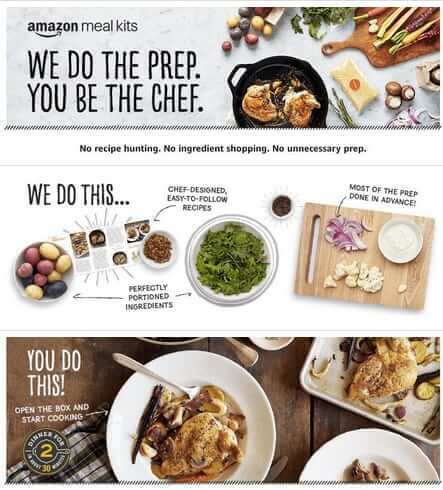 Amazon is getting into prepackaged, prepare at home meal kits with Amazon Meal Kits, and has submitted an application to trademark the slogan "We do the prep. 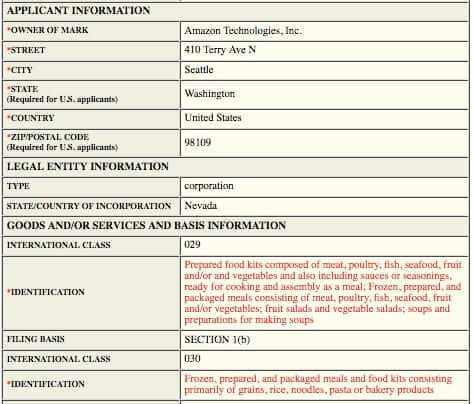 You be the chef," saying in its application to the USPTO that it will be using the trademark on, according to the filing, "Prepared food kits composed of meat, poultry, fish, seafood, fruit and/or and vegetables and also including sauces or seasonings, ready for cooking and assembly as a meal."